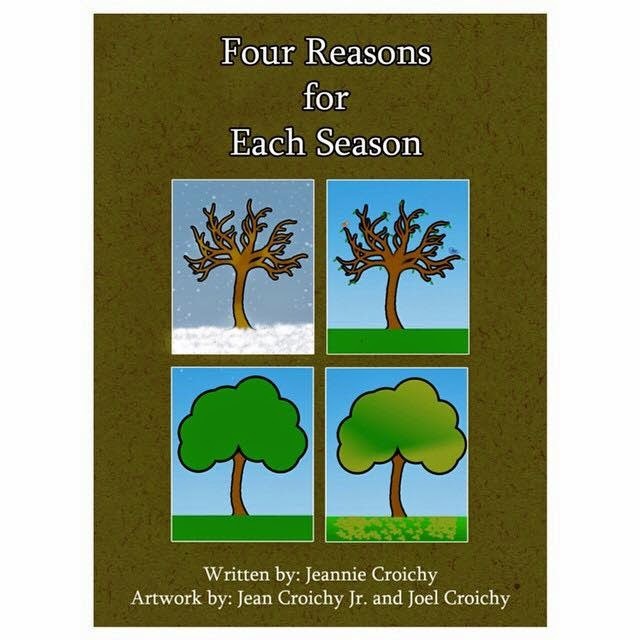 Today we are interviewing Jeannie Croichy, author of the children's book Four Reasons for Each Season. I was born and raised in Newark, New Jersey to Caribbean parents. This makes me a first-generation American. I am also a first-generation college graduate. Currently, I am earning a Doctor of Education degree in educational leadership. In addition, I am an adjunct professor. In regards to my interests, I love to write. Writing is my heart’s passion. Describe your new children’s book in a few sentences. My new children’s book is my very first published book. It was important for me to develop a book for children, but also for all ages. The book consists of four haiku poems for each of the four seasons. Four Reasons for Each Season is a wonderful glimpse of the beauty of the Earth’s seasons. Each haiku provides a descriptive visual of the exquisiteness provided by winter, spring, summer, and fall. This children’s book will allow children and their parents to admire nature’s gift to the world as a family. What inspired you to write a children’s book about the beauty of the four seasons? That’s a beautiful question. Personally, I was inspired by nature. I love walking in the woods with my dogs, Sweetie and Rosco, and just admiring everything – the scent of the air, color of the trees, touch of the green grass, and the taste of the snowflakes. These are enjoyable aspects of the four seasons. I thought it would be great and educational to share my admiration of nature with families – in hopes of children creating their own admiration and love for nature. Why did you decide to tell this story with haiku poetry? I believe telling this story of the four seasons with haiku poetry would allow children to make an instant connection with the words. Haiku poetry provides a beautiful description of feelings and images – and this is especially manifested with the theme of nature in my book. How do you hope your book will impact people? Personally, it is crucial to create an impact in the world. The future of our world is in the hands of our children. Through my book and other nature-related resources, our children will continue the legacy of appreciating nature and its seasons. However, it is important for parents to introduce this appreciation to their children. This will allow children to create their very own appreciation for the seasons, nature, and our beautiful world. Growing up, I was taught to appreciate the Earth. In school, there was a magnificent day called “Earth Day” and this celebration of the Earth still continues today. My deepest hope is that Four Reasons for Each Season would create a very special place in children. At times, nature is something that is taken for granted and it’s truly important to educate our children in appreciating nature and appreciating our seasons. Whether it’s cold or hot outside, we should all have something to appreciate about each season. Can you tell us a bit about the creative process for this book, from the initial idea to the finished book? Sure! The creative process was quite an adventurous journey. Since this is my very first book, I am undeniably so amazed at the extraordinary stages of the creative process. Writing the haiku poetry was the very first step. Inspiration was definitely in nature. At times, hiking or simply looking out of my beautiful window developed my inspiration. In regards to looking out of my window, I have a spectacular view of the woods on a hill, which is definitely inspirational. After the development of the poetry, the artwork was crucial. I am blessed to have two wonderful and artistic brothers, Jean Croichy Jr. and Joel Croichy. Both of my brothers worked very hard on creating beautiful artwork for each poem and the book cover. I am truly grateful of their artistic input in the overall process. Wonderful question! I have plenty of exciting projects in mind. I am definitely going to create more nature-themed children’s books. I am in the process of developing an animal and nature children’s book as well. In the future, I am looking forward to undertaking themes that will teach children about social issues in a creative way. Overall, I am just super excited to use my writing to inspire children and to possibly use my writing to create cherished memories. Most importantly, I would like to thank potential readers in believing in the message of this book. I am delighted to share this message with the world. It is important to educate our children in the value of appreciating nature. Four Reasons for Each Season is a breathtaking book not only for children, but also for all ages. This book will allow individuals to create their own appreciation for each season and nature. Four Reasons for Each Season is available as a Kindle format on Amazon. I’m looking forward to the printed version in the future.